Preserving and pickling is something that I have a great appreciation for. The beauty of preserving food is that fresh fruit and veg which is in season and plentiful can be enjoyed throughout the year when it is no longer available. Nowadays in supermarkets one can buy almost any vegetable at any time of year as food is imported from all over the world, but if you care about using seasonal and local produce – as I do – then you will also see the huge benefit in preserving. Rene Redzepi, head chef at Noma in Copenhagen, is the master of using seasonal and local produce. In summer is all the more crucial.I had a recipe for this amazing red onion chutney which I thought I’d lost. The last time I made it I couldn’t find the recipe so had to improvise and, although tasty, it wasn’t as good as the original. 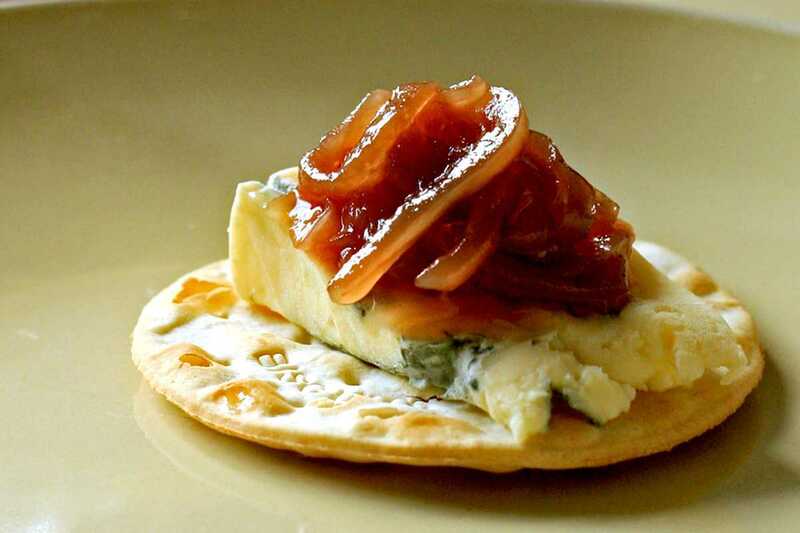 The old recipe was an adaptation of the red onion chutney that we used to make at Blackmore’s. I changed the spices and added white wine for extra flavour. It has a fantastic rich sweetness that is hard not to adore. This chutney, as with many pickles, improves and matures with age. Ideally it should be left in the jar for at least six months before eating. It will taste great if eaten immediately of course, but I recommend waiting! Serve this chutney with cheese and crackers, or put in a cheese and ham sandwich for an extra punch of flavour. Peel and thinly slice the onions along the grain and place in a wide-based pot. Take a piece of muslin cloth and tie up the cloves, star anise, bay leaf, garlic and cinnamon to make a sachet. Add this to the pot with the rest of the ingredients. Stir briefly to incorporate, bring to the boil, then simmer gently for 3-4 hours, stirring occasionally until the chutney is dark and intense and the onions are softened. Take several jam jars and sterilise them. Spoon the chutney into the jars whilst still hot, and secure the lids. Put the chutney in a cool larder (or a fridge) for at least six months before opening.